5 (five) is a number, numeral, and glyph that represents the number. It is the natural number that follows 4 and precedes 6. It is an integer and a cardinal number, that is, a number that is used for counting. In addition, it is classified as a real number, distinguishing it from imaginary numbers. The evolution of our modern glyph for five cannot be neatly traced back to the Brahmin Indians quite the same way one can trace the glyphs for 1 to 4. The (later) Kushana and Gupta Indians had among themselves several different glyphs that bear no resemblance to the modern glyph. The Nagari and Punjabi took these glyphs and all came up with glyphs that look like a lowercase "h" rotated 180°. The Ghubar Arabs transformed the glyph in several different ways, coming up with glyphs that look more like 4s or 3s than 5s. It was from those characters that the Europeans finally came up with the modern 5, though from purely graphical evidence, it would be much easier to conclude that the modern 5 came from the Khmer. The Khmer glyph develops from the Kushana/Ândhra/Gupta numeral, its shape looking like a modern day version with an extended swirled "tail." While the shape of the 5 character has an ascender in most modern typefaces, in typefaces with text figures the character usually has a descender, for example, in . Five is between 4 and 6 and is the third prime number, after 2 and 3, and before 7. Because it can be written as 2^(2^1)+1, five is classified as a Fermat prime. 5 is the third Sophie Germain prime, the first safe prime, and the third Mersenne prime exponent. Five is the first Wilson prime and the third factorial prime, also an alternating factorial. It is an Eisenstein prime with no imaginary part and real part of the form . It is also the only number that is part of more than one pair of twin primes. The number 5 is the 5th Fibonacci number, being 2 plus 3. 5 is also a Pell number and a Markov number, appearing in solutions to the Markov Diophantine equation: (1, 2, 5), (1, 5, 13), (2, 5, 29), (5, 13, 194), (5, 29, 433), .... Whereas 5 is unique in the Fibonacci sequence, in the Perrin sequence 5 is both the fifth and sixth Perrin numbers. Vulgar fractions with 5 or 2 in the denominator do not yield infinite decimal expansions, as is the case with most primes, because they are prime factors of ten, the base. When written in the decimal system, all multiples of 5 will end in either 5 or 0. In quinary, five is 10; and in senary, code and all codes above (such as decimal, duodecimal and vigesimal) five is 5. In the Arabic alphabet, ٥‎ (hāʼ) has numerical value of 5. In the Greek alphabet, ε (epsilon) has numerical value of 5. In the Hebrew alphabet, ה (heh) has numerical value of 5. In the Cyrillic alphabet, Е has numerical value of 5. In the Glagolitic alphabet, (dobro) has numerical value of 5. The kanji and Chinese character for five are both 五, and its formal writing in Chinese is 伍 (pinyin wǔ). The atomic number of boron is five. The smallest atomic mass number (the sum of protons and neutrons) for which no stable isotopes exist for any element. Humans and other primates have five digits on each hand and five toes on each foot. Five is the number of appendages on most starfish, which exhibit pentamerism. The most destructive known tornadoes rate an F-5 on the Fujita scale. The most destructive known hurricanes rate as Category 5 on the Saffir-Simpson scale. The Saros number of the solar eclipse series which began on April 4, 2720 B.C.E. and ended on May 24, 1422 B.C.E. The duration of Saros series 5 was 1298.17 years, and it contained 73 solar eclipses. The Saros number of the lunar eclipse series which began on December 22, 2455 B.C.E. and ended on March 24, 1084 B.C.E. The duration of Saros series 5 was 1370.29, and it contained 77 lunar eclipses. The Roman numeral V (usually) stands for the fifth-discovered satellite of a planet or minor planet (such as Jupiter V). Five is the resin identification code used in recycling to identify polypropylene. 5 is a common number of gears for automobiles with manual transmission. The Torah contains five books: Genesis, Exodus, Leviticus, Numbers, and Deuteronomy. They are collectively called the Five Books of Moses, the Pentateuch (Greek for "five containers," referring to the scroll cases in which the books were kept), or Humash (חומש, Hebrew for "fifth"). The Khamsa, an ancient symbol shaped like a hand with five fingers, is used as a protective amulet by Jews. Muslims pray to Allah five times a day *In Islam, particularly Shia Islam, the Panjetan or the Five Holy Purified Ones are the members of Muhammad's family including: Muhammad, Ali, Fatima, Hasan, Husayn and is often symbolically represented by an image of the Khamsa. The five sacred Sikh symbols prescribed by Guru Gobind Singh are commonly known as Panj Kakars or the "Five Ks" because they start with letter K representing Kakka in the Punjabi language. They are: Kesh (unshorn hair), Kangha (the comb), Kara (the steel bracelet), Kachh (the soldiers shorts), and Kirpan (the sword). According to some traditions of Maya mythology, we are now living in the Fifth World. In East Asian tradition, there are five elements: Water, fire, earth, wood, and metal. The Japanese names for the days of the week, Tuesday through Saturday, come from these elements via the identification of the elements with the five planets visible with the naked eye. Also, the traditional Japanese calendar has a five-day weekly cycle that can be still observed in printed mixed calendars combining Western, Chinese-Buddhist and Japanese names for each weekday. In some cultures there are five cardinal directions, including the center. 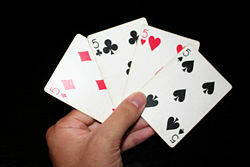 In Cantonese, "five" sounds like the word "not" (symbol: 唔). When five appears in front of a lucky number, for example, "58," the result is considered unlucky. In Discordianism, 5 is seen as a very important number as demonstrated in the Law of Fives and The Pentabarf, which contains five rules. Each page of the Principia Discordia, the primary religious document in Discordianism, is also labeled with 5 digits. Using the Latin root, five musicians are called a quintet, for example, the Jackson Five. (In an episode of Will & Grace guest-starring Janet Jackson, she declared that 5 is a mystical number and for that reason she must have precisely 5 backup dancers). The Five is the name of a nineteenth-century Russian Group of nationalistic composers who included César Cui, Aleksandr Borodin, Mily Balakirev, Modest Mussorgsky, and Nikolay Rimsky-Korsakov. Take Five is a famous jazz standard composed by Paul Desmond. It counts five beats per bar. The number of completed, numbered piano concertos of Ludwig van Beethoven and Camille Saint-Saëns. In harmonics—The fifth partial (or 4th overtone) of a fundamental has a frequency ratio of 5/1 to the frequency of that fundamental. This ratio corresponds to the interval of 2 octaves + a pure major third. Thus, the interval of 5/4 is the interval of the pure third. A major triad chord when played in just intonation (most often the case in a cappella vocal ensemble singing), will contain such a pure major third. The number of players of a basketball team on the court at a given time. 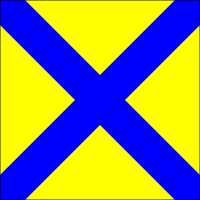 Also used in basketball to represent the position of center. The Olympic Games have five interlocked rings as their symbol, representing the number of inhabited continents represented by the Olympians (counting North America and South America as one continent). In rugby union, the number of the lock forward who usually jumps at number 4 in the line-out. It is also the number of points awarded for a try. In rugby league, the number of the left wing, and also the number of tackles the attacking team has to score a try before the handover. In baseball, five represents the third baseman's position. Five is the number of oceans in the world. The five senses are sight, smell, sound, touch and taste. The five basic tastes are sweet, salty, sour, bitter and umami. In various early cultures, the universe was thought to be comprised of five classical elements: water, earth, air, fire, and ether. In the United States legal system, the Fifth Amendment to the United States Constitution can be referred to in court as "pleading the fifth," absolving the defendant from self-incrimination. Five is the number of permanent members with veto power on the UN Security Council. Five is the least number of justices needed to make a majority decision in the U.S. Supreme Court. Quintessence, meaning "fifth element," refers to the elusive fifth element that completes the basic four elements (water, fire, air and earth). Five is the number of dots in a quincunx. There are five points in a pentagram. The Garden of Cyrus 1658, by Sir Thomas Browne is a Pythagorean Discourse based upon the number 5. The word "punch" comes from the Hindi word for five. Being true to the designation of punch, the drink Five Alive is named for its five ingredients. Five is an informal term for the British Security Service, MI5. There are five vowels in the English alphabet: A, e, i, o and u. ↑ 4.0 4.1 Georges Ifrah, The Universal History of Numbers: From Prehistory to the Invention of the Computer translated by David Bellos et al. (London: The Harvill Press, 1998). ↑ The Online Encyclopedia of Integer Sequences, A030452: Markov numbers satisfying region 5 (x=5) of the equation x^2 + y^2 + z^2 = 3xyz. Retrieved September 29, 2017. ↑ NASA Eclipse Website, Saros Series 5 Saros Series Catalog of Solar Eclipses. Retrieved September 29, 2017. ↑ NASA Eclipse Website, Saros Series 5 Catalog of Lunar Eclipse Saros Series. Retrieved September 29, 2017.